I have this large white board in my lab/office that I call “Mission Central.” Here I keep track of all upcoming launch and completion dates for important missions and experiments – generally new space (and ground-based) telescopes, planetary exploration missions, and large-scale scientific experiments. I like to lay out my scientific plans years into the future, just like I did with the recent Kepler and Planck launches – I’ll read the original mission proposal document, science backgrounder, related papers and mission details. When launch date approaches I prepare to witness the event live on the Internet. All the launches are covered in great detail on the web which is wonderful for Physics Groupies like me. For families, you can make a whole family event around a launch date, culminating in a family viewing party. Heck, invite your extended family and neighbors too, spread the wealth. Here is the short-list of upcoming missions that I’m tracking. Be sure to click on the links provided so you can drill down into all the mission information. Some of the launch dates are depressingly far off into the future, but like I said, it is comforting to have my science future all planned out years in advance. I’m excited that I received an invitation to be present for the WISE mission launch later this year. If you have any other important missions that are dear to you, please leave a comment here on the blog to share with other Science Lifestylers. WISE – Wide-field Infrared Survey Explorer, projected November 2009 launch date. I was invited to the launch of this one and will make a full report! GPI - Gemini Planet Imager, project launch date planned for 2010. Space telescope designed to image exoplanets orbiting nearby stars. LHC – Large Hadron Collider – Restart late Oct. 2009 after the catastrophic accident last year. JWST - James Web Space Telescope, scheduled launch in 2014. GMT - Giant Magellan Telescope – scheduled for completion in 2018. New Horizons – Pluto-Kuiper Belt Mission. Launched in 2006, with the first Pluto encounter in July 2015 (it takes a long time to get to the edge of the solar system!). TMT - Thirty Meter Telescope – planned completion date 2018, recently selected Mauna Kea as site. 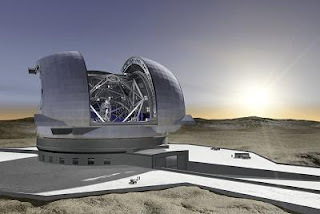 E-ELT – European Extremely Large Telescope – planned completion date 2018. Still in the process of selecting a site for the 42 meter scope.